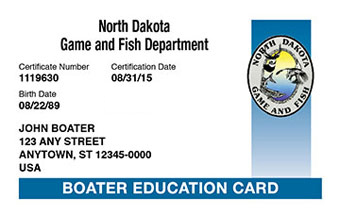 The North Dakota Boater Education Card (also referred to as the North Dakota boating license) is proof that a boater has taken and passed an approved boater education course. The North Dakota Game & Fish Department currently has mandatory boater education requirement for all persons between the ages of 12 and 15 years of age who wish to operate a powered vessel over 10 hp, including personal watercraft (PWC), unless accompanied by an adult 18 years or older. Many boaters who do not fall into this category will still wish to get the North Dakota boating license so they can save on their boat insurance. Many boating fatalities occur because boaters are not educated about boating safety. The North Dakota Game and Fish Department believes that an educated boater is a safer boater. You can write your safe boating exam directly on the Internet at BOATERexam.com®. Once you pass the exam your boater education card is mailed to your home. In the meantime, you can print off a Certificate of Completion that can be used as a temporary license to satisfy the North Dakota boating regulations until your permanent boater education card arrives. All the required safe boating training material to get your North Dakota boater education card is available at BOATERexam.com®. Simply visit our Safe Boating Course Manual section to gain access to the North Dakota specific training material. The North Dakota Safe Boating Course is accredited by NASBLA and by the North Dakota Game & Fish Department. Where can I get more information about North Dakota boating regulations and the North Dakota boater education card? Answers to most of your questions can be found on our Frequently Asked Questions page. You may also visit The North Dakota Game & Fish Department for additional information, or you can contact us and we will be glad to answer any of your questions. Get your North Dakota Boating License Online! Many boaters incorrectly use the term "North Dakota Boating License" when referring to their Boater Education Card. The Boater Education Card is NOT a boating license. Unlike a driver's license, your Boater Education Certificate cannot be revoked and is good for life. Boater Education is required for all persons between 12 and 15 years of age who operate a powered watercraft over 10hp on North Dakota waters.